Natalie Portman gave herself quite the challenge: kicking off 2018 starring in one of the best films of the year. Annihilation set a high bar for everything to come this year, and still sits on my personal top 10. But next up she has another enticing project, playing a pop star. Earlier this year, Portman replaced Rooney Mara in Brady Corbet’s Vox Lux, a tragic story of a young woman’s rise to musical stardom (no, this isn’t the millionth A Star Is Born). Thanks to some set photos and videos, we’ve seen a few teases of Portman’s wild pop star look, but the first official photo has arrived via the Venice Film Festival (h/t The Film Stage). 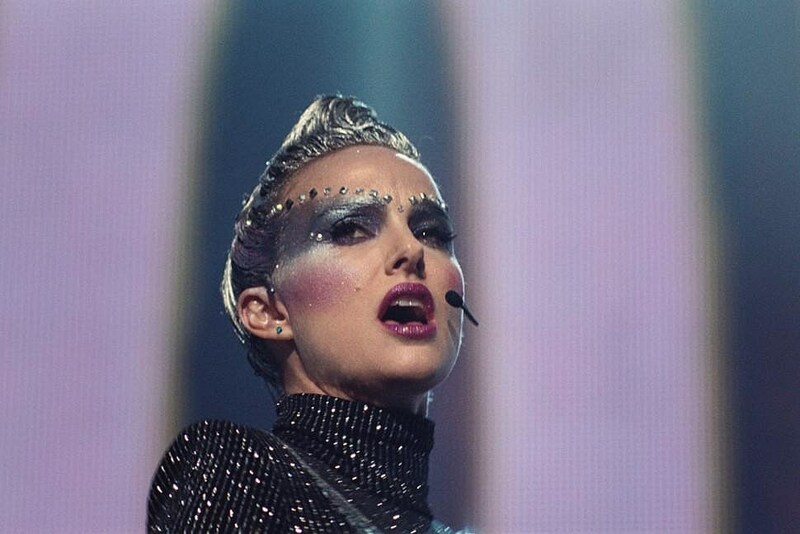 Vox Lux follows Portman as Celeste, a young woman who survives a traumatic shooting and rises to international pop stardom. The film will chart her 15-year journey, beginning in 1999. Beyond simply seeing Portman wear a bunch of glitter, shiny purple jackets, and rock a silver streak in her hair, this project is exciting for a few reasons. It’s the second filmmaking effort from writer-director Corbet (best known for his acting), following his 2015 debut, The Childhood of a Leader, which won the Best Director and Best Debut prizes at Venice. Mica Levi composed the score, and any new music from the woman behind the Jackie and Under the Skin scores is worth it alone for the ticket price. The soundtrack will also include original songs composed by Sia, so you know it’s going to be catchy as hell. And the cast is great, including Jude Law (a Closer reunion! ), Killing of a Sacred Deer‘s Raffey Cassidy, Jennifer Ehle, and Stacy Martin (Nymphomaniac). Oh, and it's also shot in 65mm. A 65mm musical spanning a decade and a half! Ambitious indeed. Vox Lux makes its world premiere at the Venice Film Festival next month. Stay tuned for more details once a release date is announce.